My grandfather, Pappy and his 3 brothers and my grandmother’s brother Norman all joined the service during WWII. 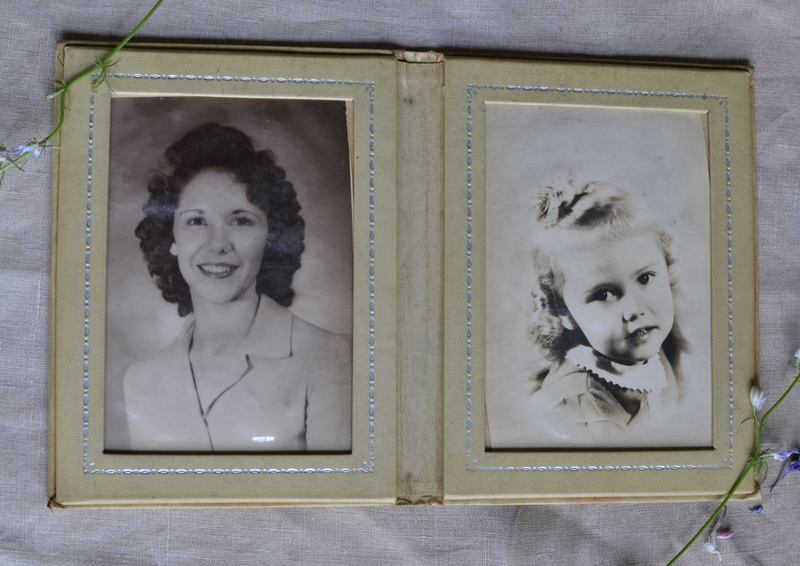 My grandmother, Elaine, and Norman’s wife Joy when to live on Pappy’s family farm while they were away during the war. My mother was not 2. 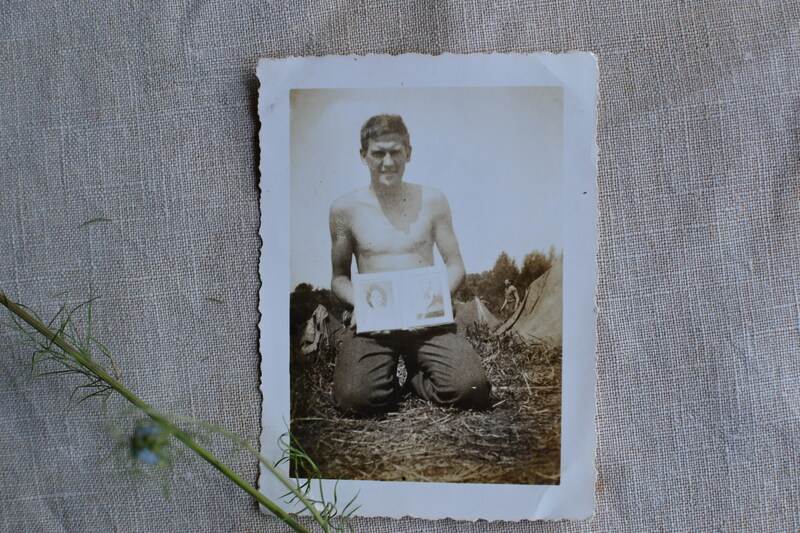 Pappy was in the Army and went to Europe. Norman was on an aircraft carrier in the Pacific. 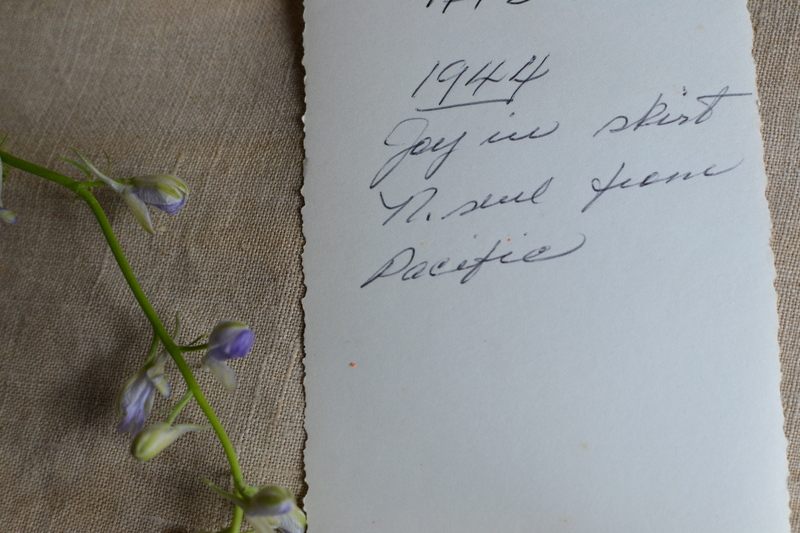 Norman mailed Joy a grass skirt and lei he got from the islands in 1944. Joy and Elaine took photos wearing the grass skirts and leis in front of a weeping willow on the farm. Elaine mailed a picture of herself to Pappy. 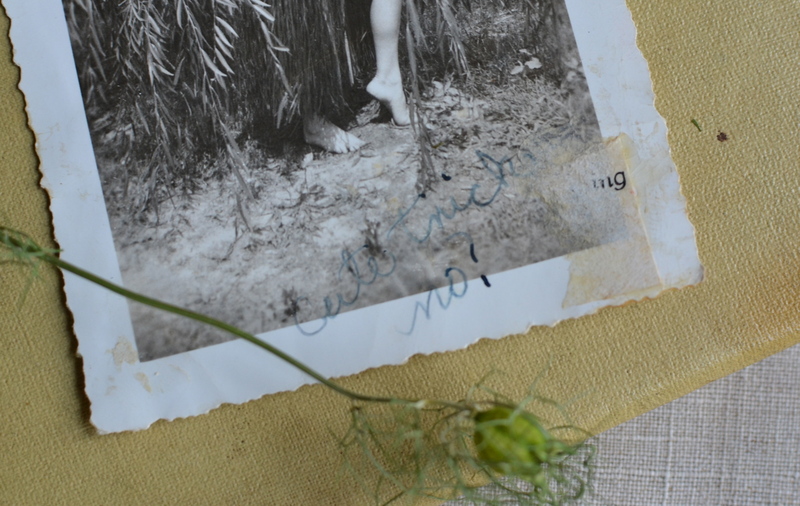 On it she wrote, “Cute trick… no?” Joy also mailed her photo to Norman. 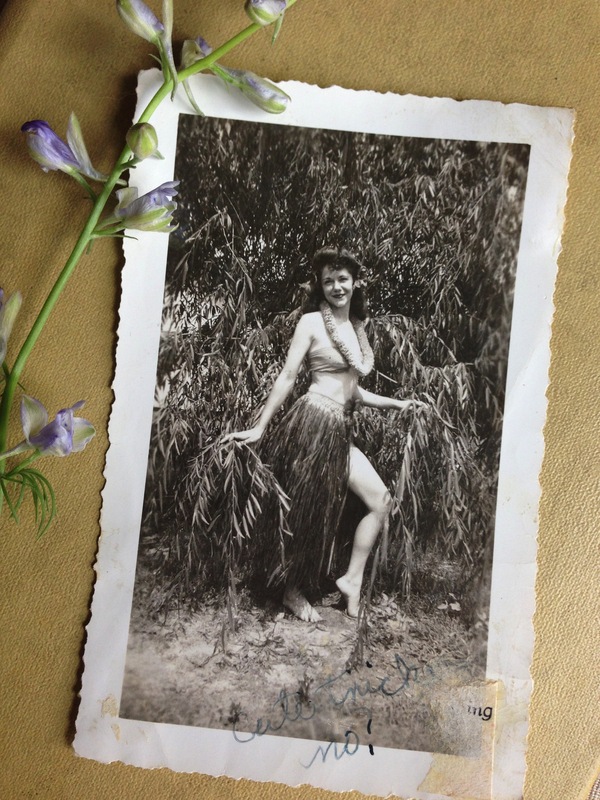 Pappy carried a yellow leather portfolio with a picture of Elaine and my mom the entire time he was in WWII and now he added this photo of Elaine in a grass skirt. For years he carried it in his breast coat pocket to be close to his heart. This he told me. Here is a picture of him during the war holding his prized possession. I always thought this picture of Elaine was so unusual and always asked to see it when I visited, but I never knew the whole story behind it. She would just say they were being silly. 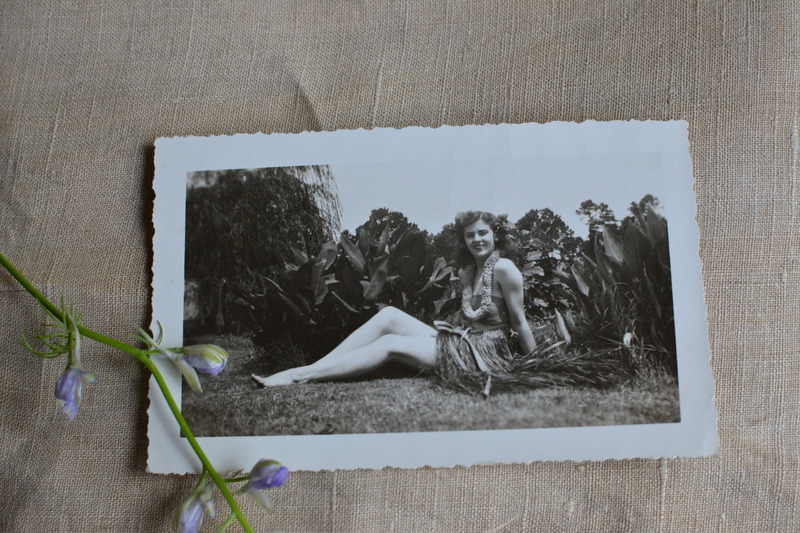 When I visited Joy with my mom a few years back we were going through her old pictures and we came across HER grass skirt picture!! I didn’t know SHE had a hula picture too. She told me the whole story and I love it!! She had several poses so she gave me one. I hung on every word of her stories. Such a lively character. I’m quite sure it was her idea to pose with it on!! Since then, I made a trip with my mom to visit my grandmother in Texas. She was in the nursing home and I brought up the hula girl picture and I asked her to tell me the story. She told me how her brother had sent them and how they posed in the outfit but they were on a farm and no men where around to see them. All the men were at war, she told me. She said she mailed it to Pappy and he was happy to receive it but her brother Norman fussed at her and said, “Elaine, that is a hell of a picture to send a man in war!” She looked up at me and said, “You know it was some years later before I understood what he meant by that”. Of course we laughed and laughed, but I loved the innocent look in my grandmother’s eyes when she looked at me. I am so happy I was able to hear her story again before she passed away. I treasure these pictures. They are priceless, taken during a time I have read so much about, from someone who I know, but from a time in their lives that I didn’t know them at all. 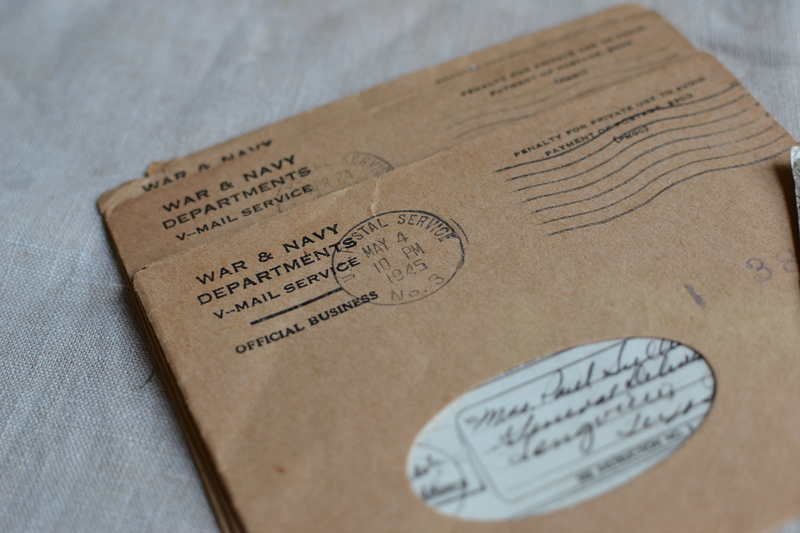 I love to hold these letters from my grandfather written to my grandmother during the war simply “from Germany” laying flat in his tent just months before the war is over but who was to know that then. He signed the letters, “your private Paul.”. Written to his hula girl in Texas. These are treasures indeed. Hold your treasures close to your heart. 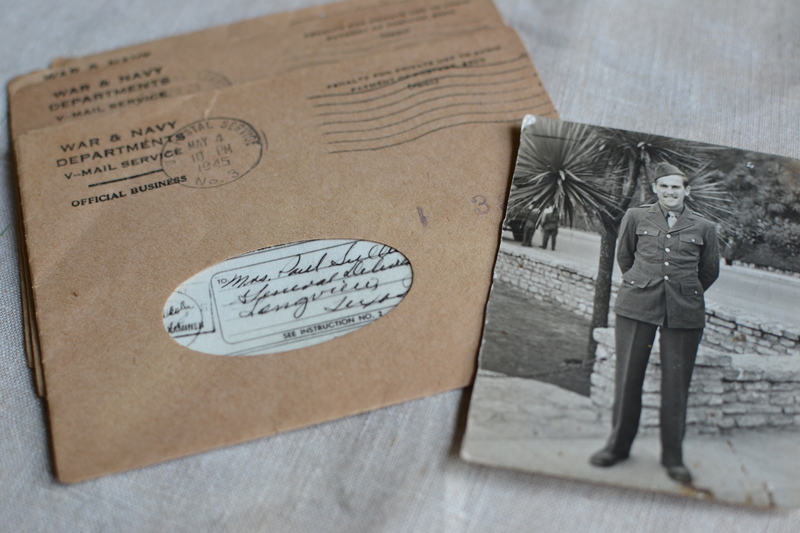 This entry was posted in vintage and tagged family, grandparents, hula, vintage, WW2 by Katey. Bookmark the permalink. Katey, such a wonderful story! My aging parents are of that era. Good read for this Monday morning. Love your posts, Katey–your loving/appreciative heart is so apparent in each one! Katey, I remember that picture but never knew the story behind it. Thank you for sharing. I’m so glad you got to get all these pics and stories from them. We moved around so much, and had quite a different lifestyle than y’all did that there is no way any of this would have it made it through from my branch of the tree, lol. i’m glad you got to have all that you did, and do. Again, thank you for showing me things I never knew!